Spotlight: FREE BUDDIES FOR ALL! The first Buddy is on us during the week of 9/14 - 9/20. We've already started to see demand for the new SPC Office Buddy, but we really want it to catch on as the best solution for producing Excel reports. As such, we will be giving away the SPC Office Buddy v.3.2 during the week of September 14-20th, 2008. This is a limited time offer and there is a limit of one free Buddy per company, so don't miss out. This is a fully licensed Buddy that will not expire and we've made it easy to obtain via our website. Simply visit http://www.SPCOfficeBuddy.com/FREE next week and follow the instructions. The wizard will lead you through registration, download, and activation. We'd like to hear from you. Tell us how the Buddy has helped your process and what you feel would make it even better. Adding subgrouping to the Minitab reports so you'll be able to automatically subgroup within your Excel Jobs. Creating Macros that would allow you to run multiple jobs in one large job. Come Visit Prolink at IMTS in Chicago!! Prolink will be on display in booth D-4635 in the Lakeside East building of IMTS. We're in the quality pavilion so you can't miss us. There will be live FARO arm and MicroRidge Gageway wireless data collection along with interactive demos of all major exports, the Buddy, and new enterprise database level reporting. We often hear from customers who measure a high volume of parts and sometimes miss the yellow or red plot changes if they aren't paying attention to QC-CALC when a part goes out of control or spec. There are several remedies to this situation including automatic reporting or trend detection with email, but today I wanted to focus on an easy way to tell QC-CALC how many points to use to determine the color of the plot. For instance, if you tell QC-CALC to use 10 points to determine the plot color, if any of the last 10 parts have a bad measurement, the plot will turn red. This way, you have a longer opportunity to notice the issue and fix it. In the example at the right, the 10th point back in history is out of spec and the plot has turned red even though points since are in tolerance. Go to Tools > Options > Configure Plot Settings > Items To Show. 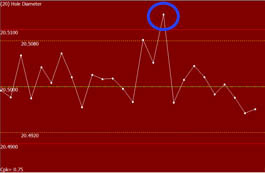 Type the number of points in the Determine Background Color section. Optionally specify using the subgroup average to determine the plot color. 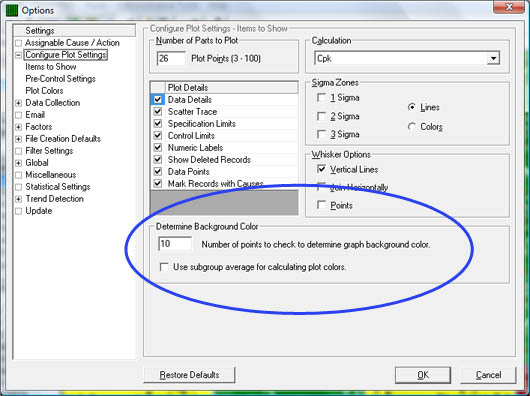 Click OK. QC-CALC will now change the background color according to your setting.